Today’s celebrity CEO is either a figurehead or an egomaniac, too public a personality to get the real work done. That work is done instead by teams of leaders: exceptional deputies who forge great partnerships to maximize both organizational and personal success. Written for CEOs, managers, and anyone else interested in modern organizations, this is the first comprehensive study of co-leaders and their often quiet power. In a growing number of non-hierarchical organizations, talent, not title, is the source of power; boss and subordinate seem more like peers, with the spotlight on great partnerships. Co-leaders understand both the executive and subordinate experience, making them better adapted to the needs of the new millennium, where those who can command and follow will prove to be the greatest assets of any organization. David A. Heenan is a trustee of the Estate of James Campbell, one of the nation’s largest landowners, with assets valued at over two billion dollars. A former senior executive with Citicorp and Jardine Matheson, Heenan has served on the faculties of the Wharton School and the Columbia Graduate School of Business. He is the author of The New Corporate Frontier and The Re-United States of America. Warren Bennis is Distinguished Professor of Business Administration at the University of Southern California and a consultant to multinational companies and governments throughout the world. 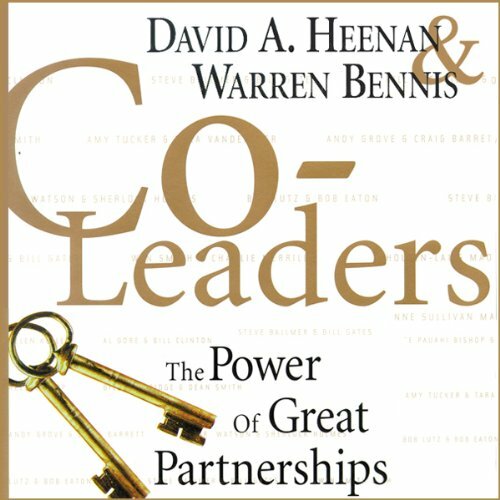 Author of over a dozen books, including the best-sellers Leaders and On Becoming a Leader, Bennis’s insights have fundamentally shaped the way we think about leaders today. If you are in an organization where you might experience the dynamic of a primary and a secondary leader this will be a good listen if only for the historical glimpse of co-leadership. The entire listen for me was worth the section on Anne Sullivan Macy and her work with Helen Keller. Facinating. If I had a disappointment it was in the lack of specific "how to's" of making the idea of co-leadership work or in bringing in the shared leadership ideas. Often in the examples (Bill Gutheridge for instance) the content was about how a secondary leader existed and thrived despite the primary leader. I would like to read more on "shared power" as well as shared leadership.